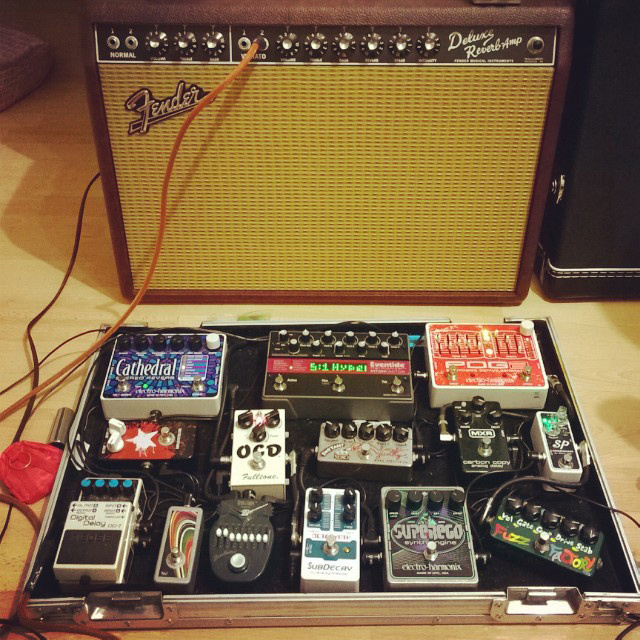 Today’s Pedal Line Friday submission is from Luís Costa. If you have a pedal line (doesn’t have to be in a board) for your rig, please email me a photo, bio, description of pedals and routing to pedalline@nulleffectsbay.com. Every Friday I’ll showcase a pedal line submission. Make sure you include any links to your band or music page. My name is Luís Costa, I’m from Portugal and what you see in the picture is the latest iteration of my ever-changing pedalboard. I started collecting pedals in 2009 when I formed my current band, You can’t win, Charlie Brown. Back then it was just a crappy $100 Behringer multi-fx pedal, a Boss SD-1 and a RC20 Loop station (I still have a video from those days: https://www.youtube.com/watch?v=RuvPJtG-lHM). The pedalboard has been growing alongside with the band ever since, usually to be able to reproduce live some sounds that are created in the studio with synths and computers. Basically, my approach to the guitar is to make it sound nothing like a guitar, which explains a lot of the synthy pedals I currently own! ZVEX Fuzz factory: the best/craziest fuzz I’ve ever used! This is actually the 2nd one I’ve owned, I tried a Vexter series some years ago (inspired by St. Vincent) but I just wasn’t ready to tame the beast back then. Some years later I decided to give it another try and it finally “clicked”, I love it to death now and it’s my go-to freakout-noise-generator. Xotic SP Compressor: I got it last year just to even-out some of the finger pickings, but it sounds so good that I leave it on most of the time. EHX Superego: this was the latest addition to the pedalboard, thanks to a tip from Fábio Jevelim of the band PAUS; I had an EHX Freeze, but he told me the Superego had much more possibilities so I ended up selling the Freeze to get this one. I haven’t used it much yet, but I’m loving the Gliss and the Auto mode so far. MXR Carbon Copy: the oldest pedal on the board. It’s such a great sounding analog delay that I never felt the need to look for something different, even though that are so many great options nowadays. It used to be towards the end of the line, but then I discovered that putting it before the POG creates a sort of spacey-shimmering effect, so it’s been there ever since. I also use its self-oscillation for the freakout moments in our live set. EHX POG2: one of my favorite pedals ever and probably the one I use the most, not counting the compressor. There’s just so many great sounds you can get out of it and so many different combinations, I can’t imagine playing without it anymore. ZVEX Instant Lo-fi Junky: this is kind of an oddball and I almost sold it a while ago, but eventually decided to keep it just because it’s so strange. Even though it’s a bit too dark for my taste, it can produce some great lo-fi warbly sounds, like an old worn-out tape or just some crazy extreme vibrato that touches on ring-mod territory. Fulltone OCD: also one of the oldest pedals on the board, it used to be 2nd in line but I decided to move it to this place because I wanted to be able to dirty the sound of the POG2 and the Instant Lo-fi. Eventide Pitchfactor: another recent addition, I’m still a bit overwhelmed with all the possibilities on this one. It will probably take me months to get the most out of it, but I’m already loving the delayed pitch-shifting effects and the arpeggiator, it’s brilliant! Devi-Ever Soda Meiser: I’m a big fan of fuzzes, even though I don’t get to use them that much with this band. At one point I think I had like 5 of them, but eventually I came to my senses and kept only the Fuzz Factory. The Soda Meiser earned back its place on the pedalboard once I discovered it works great with the arpeggiator effects of the Pitchfactor, giving them an even more 8 bit/lo-fi kinda sound. Danelectro Fish & Chips: I love the design on Danelectro pedals, even though they’re a bit flimsy (at least the old models). I got it for a bargain on Ebay and so far it has served me well. I use it mostly as a boost, or to increase the bass on the synth sounds. EHX Cathedral: another great EHX creation, it covers all my reverb needs. I particularly love the Plate and Room modes, it’s the ones I use more often. Ernie Ball VP JR 250K: it doesn’t appear in the photo, but for the live shows I use a volume pedal between the Cathedral and the DD7 to do small volume adjustments on the fly. Boss DD7: I used to have a lot of Boss pedals, most of them have been replaced by other options but this one is a keeper. It’s a real Swiss army knife, I use it to split the signal between two amps and get stereo delay, and also sometimes as a looper. It’s connected to a Saturnworks pedal for tap tempo. And that’s it for the pedal line. I use a stereo amp setup live with a Billm modded Fender Blues Jr and a Deluxe Reverb reissue, and as for guitars I alternate between my trusted MIJ Fender Jaguar, a new Squier J Mascis Jazzmaster and a Epiphone Dot.